Authors: S. Meibom et al. Even though there are several methods for determining stellar ages, these measurements can often be highly uncertain. In particular, the ages of low mass stars (less than a solar mass) are difficult to determine accurately due to their relatively long lifespans and small changes in physical properties over time (ex. 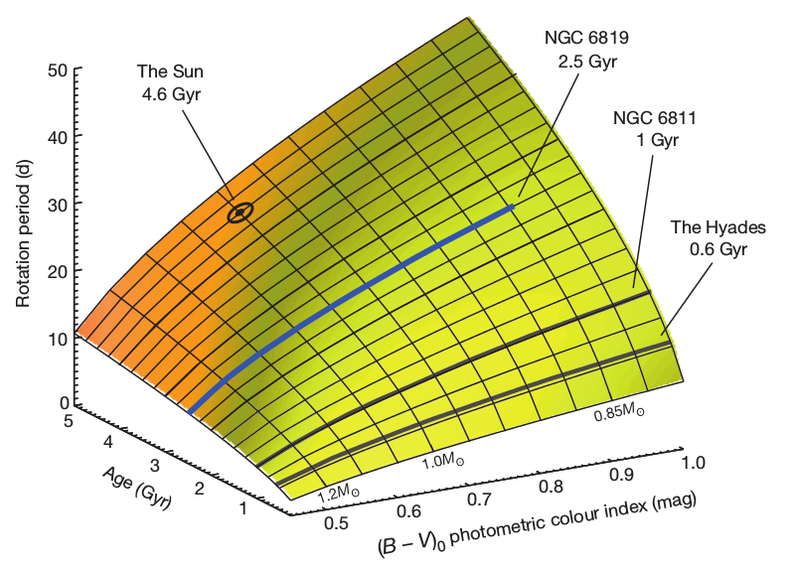 changes in luminosity over a star’s main sequence lifetime). One method of determining stellar ages is gyrochronology, which relies on using the relationship between a star’s rotational period and its age. It is expected that most stars will slow down in their spin due to the outward transfer of angular momentum through stellar winds. In this paper, the authors measure the rotation periods of 30 stars contained within the globular cluster NGC 6819. These data were taken from the Kepler mission (with observations conducted over 2.5 years), and the rotational periods of these stars range from 4-23 days. Rotational periods of cool stars are measured by looking at the brightness of the star as a function of time through photometric measurements. As the star rotates, there will be small dips in a star’s brightness as star spots move across the surface. The authors also measure the projected rotation velocities (i.e. the Doppler shift induced by the rotating stellar surface) for most of the stars, and these are consistent with the photometric rotation periods. The authors find that the individual ages of the stars lie between 2 and 3 Gyrs. The stars contained within a cluster are expected to have formed approximately at the same time, so the only major initial differences between stars should be their masses and rotation rates. They derive a cluster age of 2.5 Gyr (with 2% uncertainty), which is in agreement with the age inferred through the main sequence turn-off on the cluster’s HR diagram. It it expected there should be correlations between a star’s rotational period, mass, and age. An example of this relation is shown in Fig. 1, which shows the expected relationship between these three properties extrapolated from the measurements of a few stellar clusters. Fig. 1: A model of the relationship between rotation period, age, and stellar color. This surface is extrapolated from the color-period relationship of other clusters with known ages (shown as solid lines). The blue line shows the results from the rotational period measurements performed in this paper. Fig. 2 shows a cross-section of Fig. 1 at 2.5 Gyr (the age of the star cluster). By plotting the color and rotational period of the stars examined in this paper, there appears to be a fairly tight relationship between these two properties. Fig. 2: Color-period diagram of the stars (belonging to NGC 6819) examined in this paper. This is the blue line shown in Fig. 1. 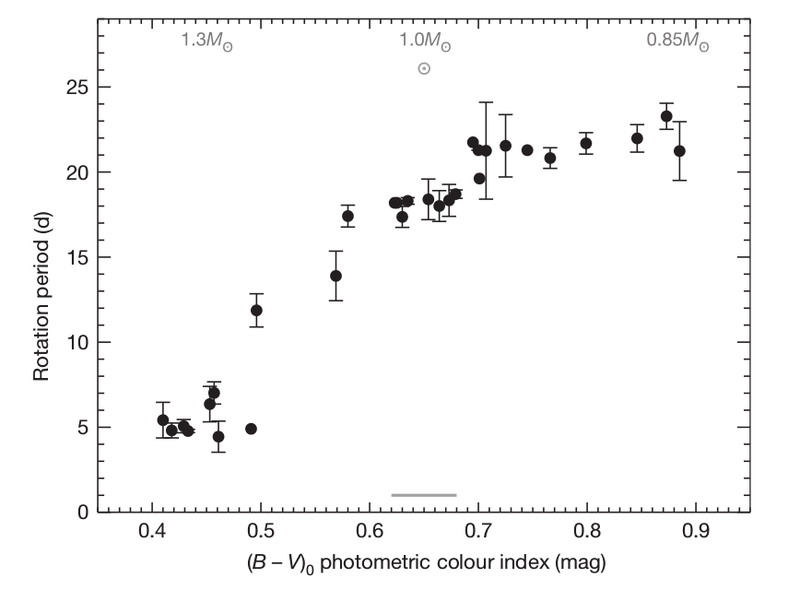 There is clearly a fairly tight relationship between the rotation period and color (which is also correlated with mass, as shown on the top axis). The authors find that this cluster age measurement method has an uncertainty of around 10%. The major sources of error are from period measurement uncertainties, differential rotation (i.e. star spots at different stellar latitudes move across the stellar surfaces at different speeds), and the spread in the initial stellar rotation periods before they spin down. A particularly problematic source of error can result from stars spinning down due to tidal interactions with other stars. Tidally interacting stars can exchange spin and orbital angular momentum, but this is only significant for systems with small separations (orbital periods of less than 20 days). Less than 5% of the stars in a cluster are expected to have these sorts of binary interactions, so the authors do not consider this to be a significant source of error. The relatively small uncertainties in determining masses and make gyrochronology a promising method for determining how cool stars evolve over time. Combined with other age measurement techniques, gyrochronology can serve as a useful cross-check and calibrator for these age estimates. Has gyrochronology then passed the bar to be considered a method of first use in determining stellar age? Or is it to be used as more of a cross check with other methods? Gyrochronology seems to be a pretty accurate model when compared to others! Can it be used to all types of stars (given that we can measure their rotation periods) or are there limitations in the model?